Campus Newton is a collaborative column (and podcast) by Alex Miller and Justin Lee, two Auburn students giving you an eye to the life and times on the Plains in 2012. Well, Alex is at home in Birmingham for the summer. But still. The password? Connecting Octavia Spencer in six degrees. After the resounding success of our first exploration into the Auburn airwaves, it only made sense that we return to signal searching on the streets of the city once again to find out more about our neighbors and community. Like our first venture, we discovered even more movie references and personal messages that proud Auburn citizens click every time they log on to the world wide web. Like plastic political yard signs and fantasy football team names, network names are the ways in which everyone can leave their mark, broadcasting whatever they feel to every neighbor and smartphone-bearing guest. This time we traveled to the Opelika Road-ish side of town, picking up signals from several close-to-campus apartment complexes, most notably (on a good nip tip) Creekside (or as at least one wireless resident calls it, Fratside), which is evidently home to celebs Morgan Freeman, Kevin Bacon, Peyton Manthing (YES!) and (the other) Kenny Rogers—at least that’s who we’re assuming is catching waves from Cecil Newton’s Traphouse. God, it was a gold mine (more like Freak Side). Here are the best few, or at least the censored few, that we could publish, below. And the vet school vets. Maybe. … and lastly, and most yesly, Cecil Newton’s Traphouse. Whatever that’s supposed to mean. * Please keep the Toomer ladies in your thoughts and prayers. 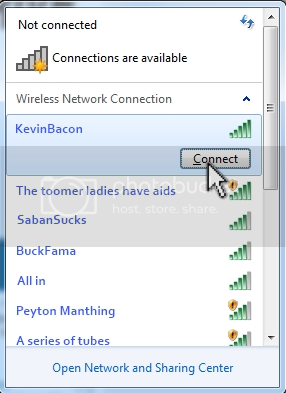 Related: The WiFi Network Names of Auburn — Vol. I.
Dove Love and Panda Hugs = Sigma Kappas and AOPis living together. i miss creekside! i recognize alot of these and this brought back many memories! glad to see the crew is still kicking it by the creek!